These Buckeye Brownies are the pinnacle of low-carb brownie recipes! The chewy, chocolaty base is worth eating all by itself, but the peanut butter cheesecake layer takes these brownies to an unprecedented level of awesomeness. 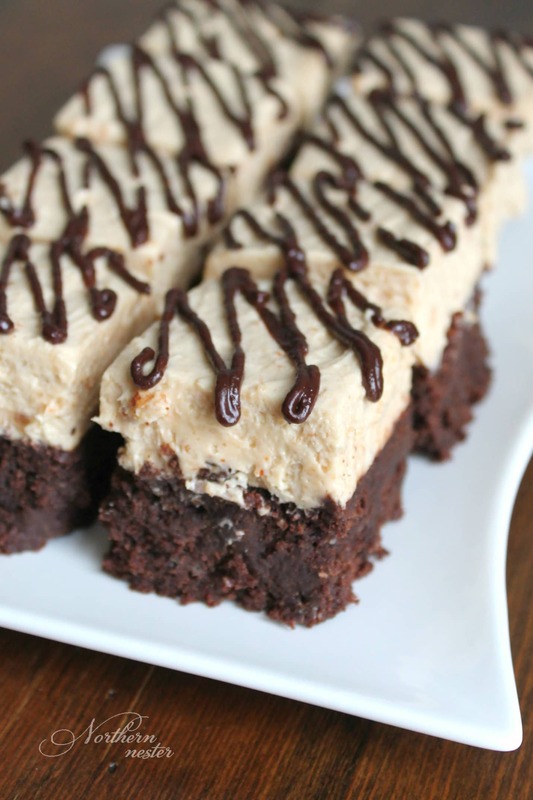 (Really, I’m not trying to sound dramatic here, but these Buckeye Brownies are my new favorite indulgent treat!). 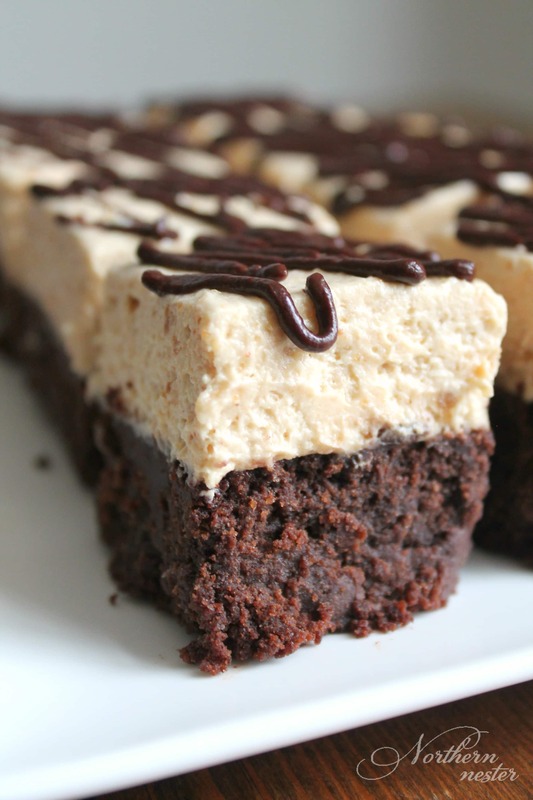 They combine two of my favorite things – brownies and peanut butter cheesecake – into one incredible dessert. A perk to these Buckeye Brownies being so rich and filling? You can get 16-20 servings out of one batch! They are ideal for company, gifting to gluten-free, diabetic or Trim Healthy Mama friends (or Keto friends! ), or storing in the freezer for when your “Aunt” comes to visit…. These Buckeye Brownies are the pinnacle of low-carb brownie recipes! The chewy brownie base alone is worth eating by itself, but the Peanut Butter Cheesecake layer takes it to a whole new level of awesomeness! A rich, decadent THM S.
Pre-heat oven to 350 F. Line 8x8" square baking pan with parchment paper. Place butter and chocolate in saucepan and melt on lowest heat until smooth, stirring often. Stir in remaining ingredients until just combined. Pour batter into prepared baking dish. Bake at 350 F for 35 minutes or until toothpick comes out clean. Cool completely. To make the Peanut Butter layer, whip heavy cream with xylitol until stiff peaks form. Set aside. Beat cream cheese and peanut butter together. Add in whipped cream and beat until smooth. Spread over brownie layer. For the drizzle, melt chocolate, cream, and stevia together until smooth. Spoon into a ZipLock bag and snip off the end. Pipe onto peanut butter layer. Refrigerate brownies for at least 3 hours or overnight. These brownies are quite calorie-dense, so they should be reserved for special occasions. Oh man! You had me at Buckeye… Can’t wait to try these yummies… in two weeks! Hope you enjoy them, Jana! This is next in my dessert rotation to try, it looks so good. What sweetener can I sub for the xylitol (and in what measurement)? I use mainly stevia because sugar alcohols upset my stomach. Thanks! Hi Emily, you can use Super Sweet in a quarter of the amount. I’m not sure of the stevia ratio off the top of my head, but I think you would need the bulk of another sweetener in the brownie base for it to work properly. These look amazing! Step 3 calls for whipped cream, but it’s not listed in the ingredients. You can usually find espresso powder by the instant coffee in your grocery store. I just made these tonight! They are SOOOOOO good! I love all of your recipes and have been following your tips on eating simpler and lighter but I just had to try these. You are my new favorite blogger! Thank you, Naomi! I’ve been trying to eat lighter too, but man oh, man! Every once in a while, I need something rich! How many net carbs are there in each serving? I topped the brownie layer with your 3 ingredient cheesecake bowl recipe. Saved some calories and it was still deliciously rich. Love your recipes!! I would like the three ingredient cheesecake bowl recipe, please. Hi there, do you have the nutritional information for these? Thank you! I too would like the nutritional content. These sound delicious! These look A-M-A-Z-I-N-G! I will pop the recipe into myfitnesspal and what the macros look like. Don’t care about the calories but sure hope I get to try these! This hads the be the recipe I have been drooling over. This is my next recipe for next week!!!! I made these!! So good!! I loved them after they had been in the refrigerator overnight!! I probably ate more ham 1 serving. Wondering about the nutrition information!! Thanks so much!! Can these be frozen in individual servings? Yes, that’s exactly what I do! Can I use THM Baking Blend in place of almond flour? I made this in a 8×11 is that ok? Can you tell me how many ounces of chocolate that would be? Thanks!